Fantastic photo! Thanks for the info on Jan Carstensz. Such a wonderful but dangerous atmosphere. 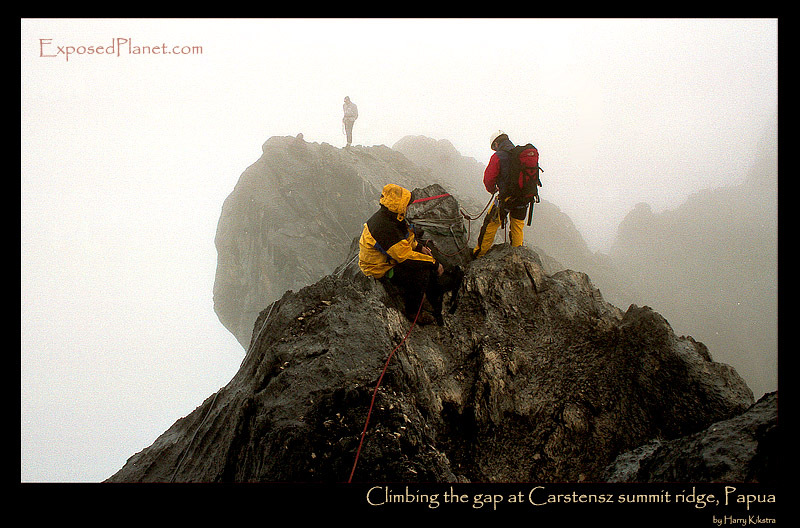 The story behind "Climbing the gap at Carstensz Pyramid summit ridge, Papua"
Though the lowest of the fabled 7 summits Carstensz Pyramid offers some exhilarating climbing. After summiting late October 1999, we were on our way back across the long summit ridge when we came upon the Gap again. In theory we should have been able to see the sea to the South-West as Jan Carstensz saw this peak from it when he sailed past in 1623. Later nobody believed him when he said that he saw snow and ice near the equator, but the mountain kept his name, though the Indonesians called it Puncak Jaya – Victory Peak. Jaime and Jose are almost ready to do the abseil in the gap, while climber Leszek Cichy already had climbed back up on the other side and is standing on the ridge. He had just finished climbing the 7 summits, 19 years after a winter ascent -the first ever- of Everest was his first.. Shot with Canon 500n, October 1999 on some Kodachrome film.